The “fused reptile” was discovered in the Western U.S. and described by Brown in 1908. 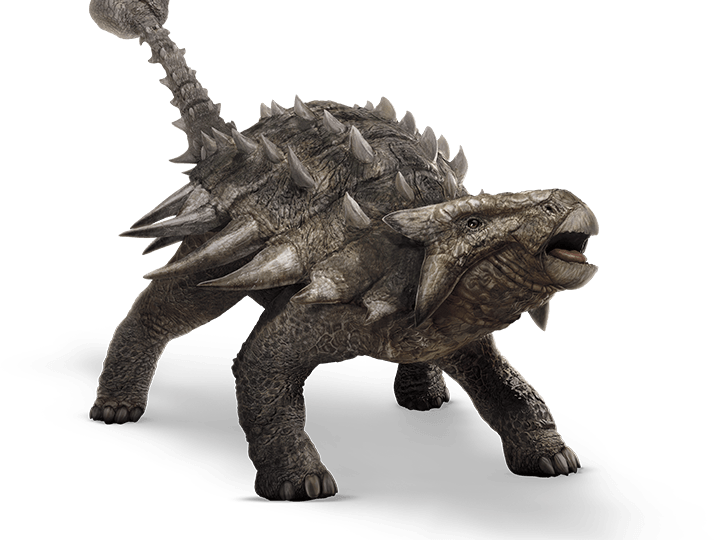 Ankylosaurus belongs to the family “Ankylosaurinae” not to be confused with the clubless “Nodosauridae”. 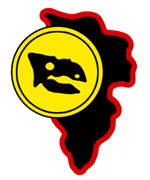 For the exception of Africa, Ankylosaurs have been found world wide (including Antartica). Ankylosaurus material has been found in the Hell Creek Formation (Montana), Lance Formation (Wyoming) USA, and Scollard Formation in Alberta, Canada. 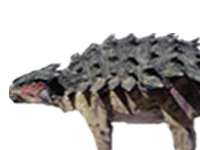 Ankylosaurus lived during the late Maastrichtian. According to “Jurassic Park /// Comparative Size Chart” (CSC for short) Ankylosaurus was 8 meters and half (28ft) long, almost 3 meters (9ft) high and weighted 4 tons. The last and largest Ankylosaurus lived in the Late Cretaceous about 65.5 MYA. 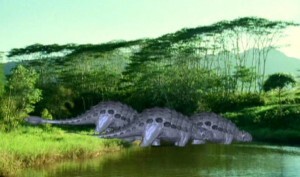 Ankylosaurus was seen in the river scene and a short interlude scene (eating foliage). There was also a deleted scene where a few Ankylosaurus were crossing a river on Isla Sorna in front of the InGen barge. The Jurassic World theme park on Isla Nublar housed Ankylosaurus as one of the dinosaur attractions. Ankylosaurus was housed in the Gyrosphere attraction, and guests were able to view them up close through the safety of the Gyrosphere. 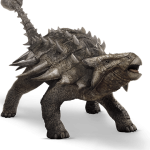 According to the In-Universe Jurassic World website, the Ankylosaurus has a ‘medium’ threat ranking. According to the Jurassic World size chart, the Ankylosaurus on display are noted to be 25 ft long, and 6ft tall. Its tail swing can generate 400 megapascals of force. A group of five Ankylosaurs were seen in the jungle when Zach and Gray Mitchell steered their Gyrosphere out of the attraction into a restricted area. It is unclear whether these were wild Ankylosaurs or if they had merely wandered out of their habitat. As the Indominus Rex attacked the Gyrosphere, the Ankylosaurs repeatedly slammed the Gyrosphere ball out of panic, as they were stalked by the predator. The Indominus ultimately cornered one Ankylosaur, and attacked it. The Ankylosaur managed to fend off its attacker briefly, however the Indominus Rex succeeded in flipping the animal on its back, and tearing its throat out, killing it. Multiple Ankylosaurs can be seen fleeing from the eruption of Mt. Sibo. Along with several other fleeing animals, multiple specimens of this animal jumped in panic off of the cliff and proceeded to drown in the water. Shortly afterward, an Ankylsaurus captured by Ken Wheatley and his poachers could be seen being forced from it’s cage to be loaded onto the Arcadia for transport to the mainland. of the structure in cages until it was time for the auction to begin. The Ankylosaur was the first animal to be auctioned off by Gunnar Eversol and Eli Mills. The animal fetched 10,000,000 USD at the auction, and was promptly shipped off to the buyer via truck after the sale was concluded. Later, as the gas leaked caused by Blue’s escape caused the imprisoned dinosaurs to suffocate,Owen Grady and Claire Dearing chose to let the animals, including Ankylosaurus out of their cages and into the general subterranean level. The Ankylosaurus specimens escaped along with the other animals, when Maisie Lockwood freed the animals from the confines of the mansion onto the mainland. The Ankylosaurus specimens proceeded to participate in the stampede to freedom which resulted in the near total destruction of Eli’s mill’s car, and the trampling of at least one of Eli Mill’s security team.